Some mighty fancy floral-carved El Paso Saddlery leather sets off a pair of ivory-gripped S&W .44 Specials. Suddenly I heard a loud thud from a book sliding off my lap and waking me up. I’d been spending so much time in it I’d fallen asleep. The book in question is Holstory: Gunleather of the Twentieth Century by R.E.D. (Red) Nichols and John Witty. The former is a familiar name to any of us who have followed the development and history of great leather as he had much to do with the designs coming from Bianchi in the 1970s and 1980s while the latter is a collector of historic leather. Obviously a lot of research went into this book that basically covers holsters from 1905-1985. The mailman delivered it just before lunch and within 24 hours I’d read all the text and picture captions. It took me three sessions plus several glasses of iced tea to travel the full-color pages. A perfect cover for a grand book — Elmer Keith’s Berns-Martin double rig. Any serious sixgunner has a foundation that is actually a three-legged stool. One leg is the gun, one leg consists of the stocks and the final leg is a quality holster. I purchased my first sixguns in 1956 and not only have I been accumulating them ever since, I also have a large file of articles and advertising of the other two legs as well as making holsters and belts myself. In the early 1970s I even talked with Milt Sparks initially about him setting up a shop for me to do leather work, however I figured I just didn’t have the time. My first brand-new DA sixgun was a 4" S&W Highway Patrolman for which I purchased a set of Herrett Trooper stocks and a Don Hume “Tom Threepersons”-style holster. My Ruger .22 Single-Six and .44 Flat-Top Blackhawk were both carried in George Lawrence leather while I made my own belt and holster for my .357 Blackhawk. Both of these makers are found in Holstory. Early on in my sixgunnin’ life I was exposed to great leather by reading Elmer Keith, especially his 1955 edition of Sixguns. Authors Nichols and Witty could not have come up with a better way to highlight the message of their book than by the picture found on the front of the dust cover. 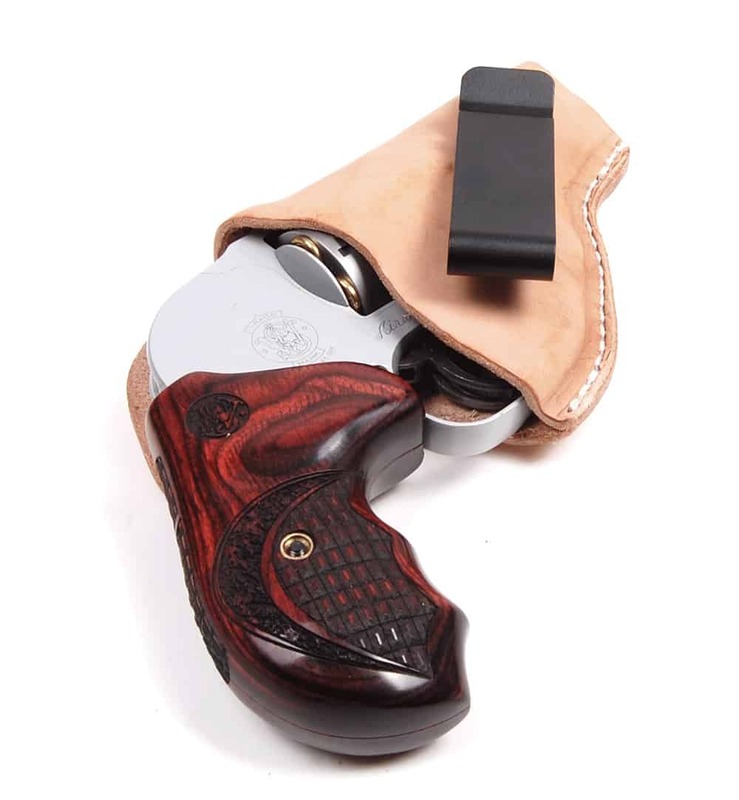 There in beautiful color is the rarest set of Berns-Martin holsters — namely Keith’s own double rig, basket-stamped outfit. The belt has two rows of cartridge loops for .44 Special and .38 Special. Keith’s pair of 6-1/2" Smith & Wesson sixguns are shown, both of which are fitted with Kearsarge custom pistol stocks. All three legs of the sixgunnin’ stool right on the front cover! It gets even better on the inside! The first three chapters cover A.W. Brill, Tom Threepersons and S.D. Myers, making for fascinating reading. Most sixgunners know there were actually two Tom Threepersons, one being the lawman who came up with the famous holster design while the other Tom Three Persons was a Canadian Indian and champion rodeo rider. Over the past nearly 100 years they have often been interchanged and Holstory straightens much of this out. All of the holster designs I became familiar with as a young shooter are found somewhere in these pages. In addition to the first three already mentioned there are chapters dedicated to Berns-Martin, H.H. Heiser, Audley, Arvo Ojala, Chic Gaylord and John Bianchi. The last chapter ties up everything with some of the lesser-known craftsmen. I found it most interesting to discover most of the names I thought were actual leatherworkers — the folks who actually made the holsters marked with their names themselves — were not. Some of the most well known names are actually found to be designers or companies instead of leathermakers. For example, my 60-year-old Ojala Hollywood Fast Draw rig was not made by Ojala himself in all probability. Much of his early leather was actually made by Ed Bohlin. And connected with the Ojala story were the Three Aces, three men whose first name began with “A” — Arvo Ojala, Andy Anderson and Alfonso Pineda. The latter two worked for Ojala and then struck out on their own. Each of these three men contributed a unique design. We also learn the difference between the Eastern School and the Western School of holsters. Basically, the Western School used a heavy welt along the back edge of the holster while the Eastern School went for the lighter construction without a welt. In addition to all the great pictures of classic leather, we also have the story of who actually worked for who, who designed what, and who copied what. Thanks to Red Nichols and John Witty for bringing all the great leather of the 20th Century together in one place!